We've gotten quite a few peppers from our CSA in the last couple of weeks. Until this week most of them were green & I've always strongly believed I don't like green peppers. Well, Matt has been "sneaking" them in our stir-fries lately & it turns out I do like them as long as they are well cooked (I still think I'll avoid them raw). Its a good thing I discovered this or I would have never tried sausage & peppers & oh was it good. The flavors of the onions & peppers cooked in a little red wine with a good Italian sausage make for a perfect sandwich; a little sweet, a little savory & just rich enough. 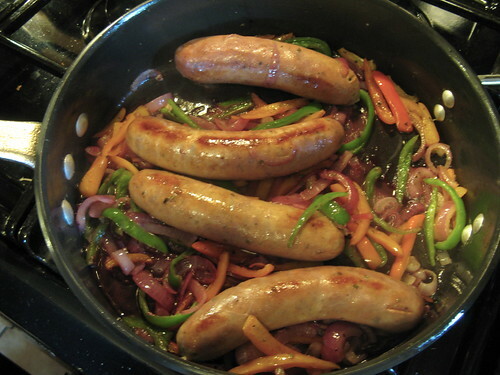 The peppers & onions are quite mild from their sauté & match up well with the slight spiciness of the sausage we used. We served this on hoagie rolls as a sandwich but you could also cut up the sausages & serve it with pasta. Heat the oil in a skillet over medium-high heat. Add the sausages & brown on all sides. Remove the sausages from the pan & set aside. Melt the butter in the skillet. Add the peppers, onions, oregano & basil plus salt & pepper to taste. Sauté for 5 minutes until the onions are translucent & the peppers & onions are soft. Pour the wine into the pan. Add the sausages back to the pan. Cover & turn down the heat to low. Allow to simmer for 15 minutes or until the sausages are heated through. 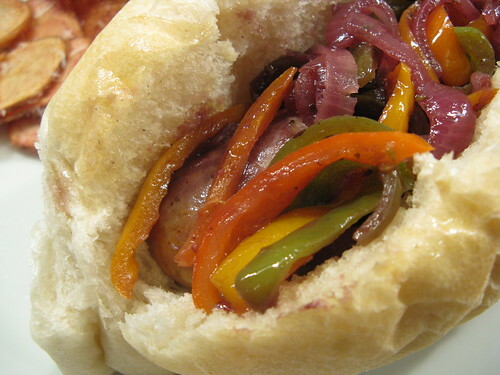 Serve the sausages on split hoagie rolls topped with the peppers & onions. I've been wanting to make sausage and peppers for the longest time. I don't like green peppers too, but I now find they do add something to a cooked dish when they're there. So maybe, I'm starting to change my mind about the green ones. Looks yummy! The hoagie rolls look soft and pillowy. Sausages and peppers. This sounds divine!! I'm making this tonight for dinner. I don't have hoagies, but hopefully hot dog buns will do. I also have a Trader Joe's three pepper mix to sub for the fresh stuff. This reminds me of home! A goog ole South Philly sausage and peppers! It is hard to find a good one here in the ATL. Most use hard bread or sausages with really tough skins. Mmmm...these beautiful sausages and peppers are reminding me of the annual Italian festival I used to go to in Westport, CT during high school. Very fond memories! Great picture- the peppers look so good. I really shouldn't look at food blogs in the morning - this has my stomach growling and me wanting sausage and peppers for lunch!